One of the pillars of international human rights accompaniment is the backing of a strong and active international network that commits to ongoing education of the international community about the human rights context of those we accompany, monitors the specific situations of those human rights defenders, and is ready to take action during high-risk moments or in the event human rights violations take place. At NISGUA, our entire grassroots base is involved in this important work. Through NISGUA’s Guatemala Accompaniment Project, we also have a core base of former accompaniers and Sponsoring Communities who make a deeper commitment to our accompaniment partners. UUCA-PAG is one of these core groups and to date has provided support to 15 NISGUA accompaniers and the groups they accompany through sponsorship. 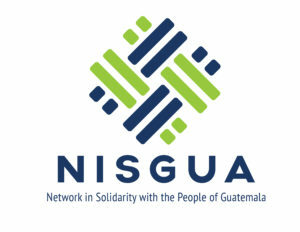 In November 2015, NISGUA joined with the leadership from the Unitarian Universalist Church of Arlington (UUCA) in Virginia to strengthen ongoing relationships of solidarity with partner organizations in Guatemala. 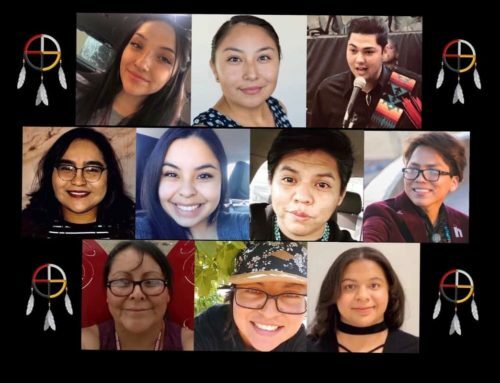 Working within a delegation model that forwards horizontality and mutuality, we seek to visibilize the regular and strategic action that groups like UUCA are undertaking on behalf of accompanied groups, as well as NISGUA’s campaign partners. 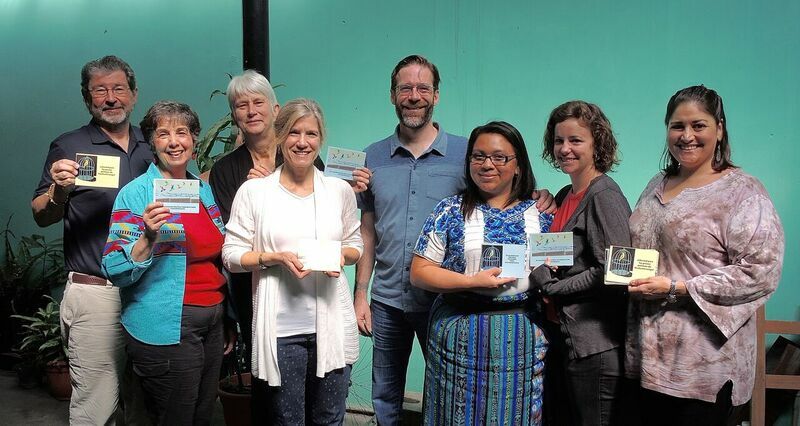 Members of the UUCA congregation came to Guatemala prepared to share information on concrete actions they are taking in the United States in support of the groups and communities they met with while in Guatemala; as part of a commitment to amplify the voices of human rights defenders in Guatemala, they carried out a substantive report-back to their home communities upon return from the delegation. UUCA delegates give postcards to Cesia Juárez with messages of support for her father, Chico Palaz, and other political prisoners currently being detained in Guatemala. 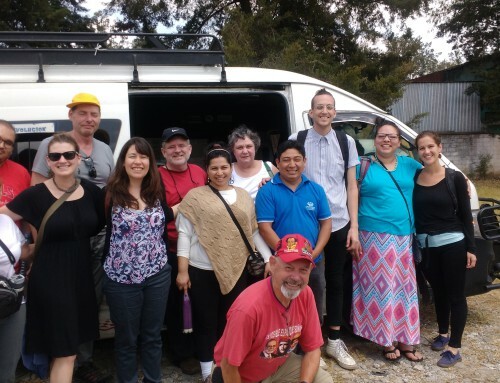 As a Sponsoring Community for our Guatemala Accompaniment Project (GAP), UUCA provides direct economic and political support to NISGUA human rights accompaniers through their Partners for Arlington and Guatemala (PAG) project. In addition, a central commitment of our Sponsoring Communities is to take political action in response to periods of elevated risk, or direct threats or attacks to accompanied groups, as reported to us by our accompaniers. UUCA-PAG presented to each of our partners an account of the actions they have taken in support of NISGUA’s accompaniment and advocacy relationships. UUCA-PAG reported directly to these partners on a variety of actions, which included postcard campaigns in solidarity with the family members of political prisoners, divestment research on companies currently threatening communities around Tahoe Resources’ Escobal mine, and community messages of support for groups who receive international accompaniment, such as the Association for Justice and Reconciliation (AJR) and the Center for Human Rights Legal Action (CALDH). As local hosts for NISGUA speaking tours, UUCA was also able to reconnect with former tour presenters Anselmo Rodán of the AJR and Llan Carlos Dávila of CODIDENA, who they had hosted in Arlington. 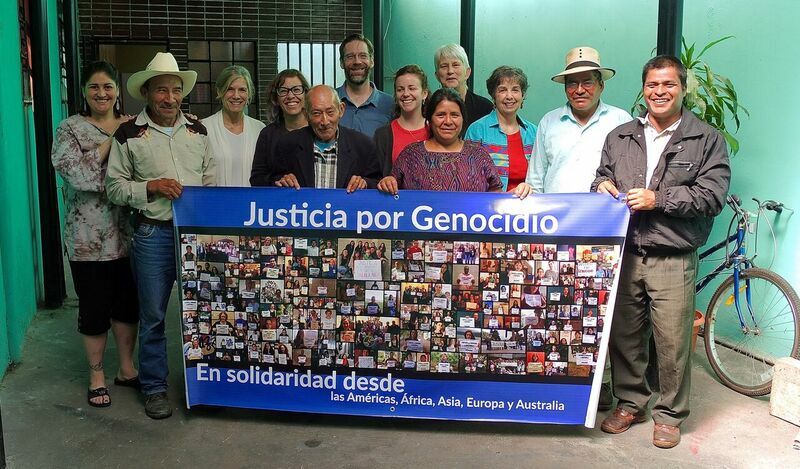 Standing in solidarity with the Association for Justice and Reconciliation, UUCA and NISGUA present messages from around the world in support of their struggle to seek Justice for Genocide. Responding to calls made by communities impacted by Tahoe Resources’ Escobal mine asking shareholders to divest from the company, delegates visited different groups involved in the community-led resistance to the mine project. During a community assembly, UUCA reported back on UUCA’s investigation into church investments. Organizations and communities impacted by Tahoe’s possible expansion in the area took delegates to a look-out point where they could get a feel for the closeness of the mine, operating meters away from nearby houses. As a network, we are constantly working on our understanding of mutual solidarity, while building relationships of accountability. Reporting back to home communities is a key way we can hold ourselves accountable to the responsibility of bearing witness, hearing testimony and stories. UUCA-PAG delegates developed an art installation experience for their community entitled “Boxes”, with replicas of the cardboard boxes they saw during two tours: First, at the National Police Archives, where they saw storage rooms of files detailing atrocities committed by the police during the internal armed conflict, and then at the Forensic Anthropology Institute of Guatemala, where they witnessed rooms filled with boxes of human remains resulting from their exhumations carried out during investigations into genocide and other crimes against humanity committed during the internal armed conflict. The replica boxes of the UUCA exhibit were stacked 6 feet high at the entrance to the UUCA sanctuary for Sunday service and also included in an altar. 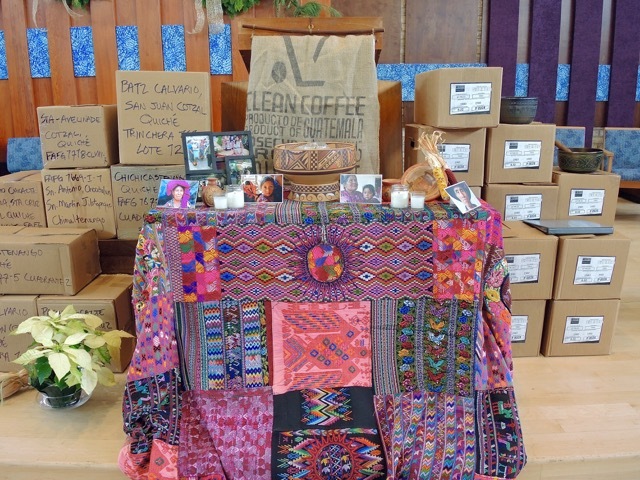 Delegates created an altar to accompany a presentation during Sunday service, in which the congregation was invited into the UUCA-PAG experience in Guatemala. During the service, the delegates read quotes collected from people they met with on the delegation, bookending the moving sermon by Reverend Aaron McEmrys. Click here to listen to the sermon, found at minute 35:25 on December 13, 11:15 am worship (in Archives). These quotes represent a small sampling of the deep and moving experiences the delegates had while meeting with Guatemalan human rights defenders and communities fighting for social justice and defending land, life and culture. 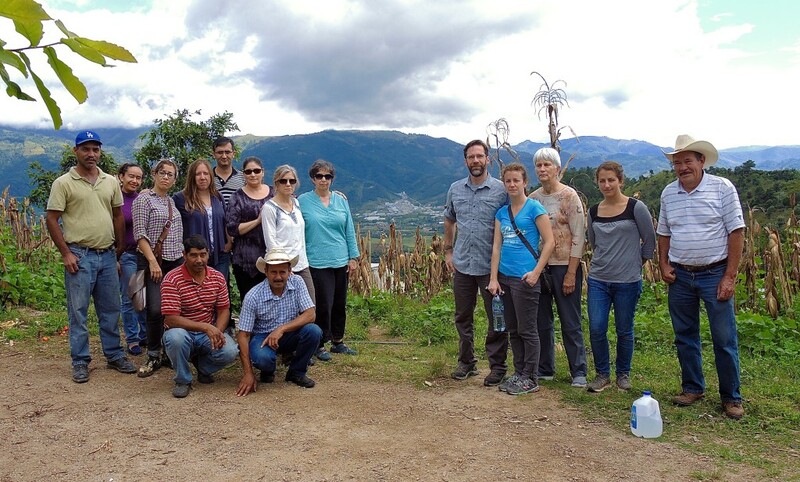 Through the ACOGUATE project, NISGUA provides international accompaniment to the Association for Justice and Reconciliation, the political prisoners of Huehuetenango and their families, and CODIDENA. NISGUA also engages in strategic campaign work with the communities in resistance to Tahoe Resources’ Escobal mine.